“We’re currently training hard, pounding the streets of Canterbury and Whitstable 3-4 times a week. It’s not too difficult to get out of bed when the sun’s out. Its especially lovely to run by the sea. When it’s cold, it’s REALLY cold with a biting wind off the north sea. Please think of us on those cold, rainy nights! 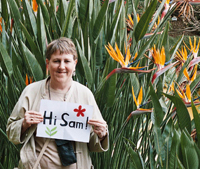 “Raising money for Sam is really giving us the motivation we need, especially as we know that every penny will be going directly to him. Watch this space for training news and details of the event! My name’s Carolyn, and I’m Madeleine’s mum. This is a picture of me in Funchal on the island of Madeira. People sometimes call it ‘the island of flowers’. Because it’s so warm there all year round, there are always lots of flowers out. The proper name for the flowers in this picture is strelitzia, but people usually call them ‘bird of paradise’ flowers – you can see why! Our Birmingham office has joined the ranks of fundraising for Sam with its new book box, all items £1! This permanent feature is now in the office located at John Bright St, all book donations welcome! Money is also being raised by the kind donations of Sally Cain Cards and Mementos. She donates 10% of all sales to Suff4Sam. Products include handmade cards, keepsake boxes, personalised mementos and scrapbook albums. 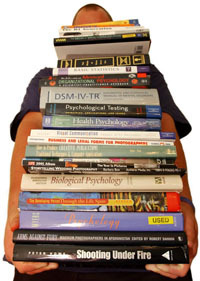 We’ve done a bit of maths this week and worked out that the grand total made from our book boxes is £1600! Not bad considering each item is 50p! It’s not all chick lit and science fiction you know. Some really good stuff has been donated. Afterall when you’ve read something, do you really need to keep it gathering dust? Release it to the world and let someone else enjoy it. Our London and Peterborough boxes are going from strength to strength and now the Birmingham office have joined in too. Why not start a book box in your office? Have a spring clean and raise some money for stuff4sam. It’s easy! Thank you all very much for your recent messages – the birthday cards, comments and letter from Copeland Day Centre. Sam had really good time during his birthday week. He had three birthday parties, two for himself and another for his friends. We invited all his nursery friends, which added up to eight kids and their mums and some siblings!! Sam really enjoyed opening his presents, but didn’t like everybody singing happy birthday song!! 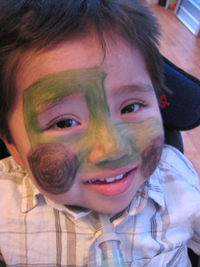 One of these pictures is of Sam with his favourite tractor painted on his face on his birthday. Today we hit our big target of £20,000! 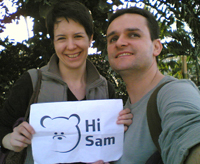 When we first started stuff4sam back in December 2005 it seemed like a ridiculously high number but thanks to your generosity and support we have got there. 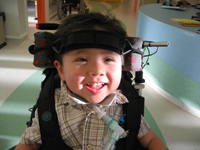 Because of this money, Sam has a buggy which incorporates his life support machines meaning that he can leave the house, an FES bike to develop his muscles and keep his heart healthy and Arm Supports to develop the movement in his arms. But we’re not stopping here! Our next target is £30,000! Watch this space! We love Fridays! The London raffle was drawn and along with some last minute sales raised an extra £100. Peterborough had a cake and Easter Egg extraveganza and made £100. The Peterborough print floor also had a collection and made £35. So all in all a great day. £235 raised taking us over £20k! 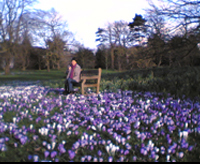 A couple of weekends ago we went to Kew Gardens. It was a lovely sunny cold day. We had a picnic under a big tree with squeeky branches and watched the world go by. Later we went into the Palm House which is where we took our picture. It was really hot in there! We went up a spiral staircase so we could be as tall as the trees. Outside in the park there were beautiful carpets of crocuses, all purple and white. It felt very spring-like. That means Hi Sam in Thai. 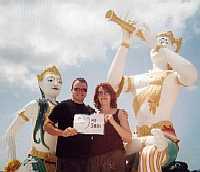 Here’s a picture of me and Chris on Kohn Samet with some Thai gods. Apparently the princess (on the left) was kidnapped by an evil spirit and the prince had to use his magic flute to rescue her. We saw nothing like that when we were there but the curry was world class! Not sure what the collective noun is for donations (answers on a postcard please) so thought of a new one – a cheer of donations. Anyway, that’s what we have had today. Big thanks to people who chose to celebrate Sam’s birthday in this way and helped us get ever closer to the £20k mark. Special thanks go to Copeland Day Centre in Peterborough for their support.